Get free advice and estimates from handymen in your city. Whether you want to watch movies or just see the game on a big screen, many options for home entertainment exist. TVs and projectors both give you a way to view your favorite show and offer the capability to stream from your favorite viewing site or play a DVD or Blu-ray. We outline the differences between them below so that you can make a more informed decision about which is right for your home. In terms of actual space, projectors are relatively small. Each projector has a range of sizes of how large an image it can project with clarity. Some provide you with the option to fill an entire wall clearly, while others give you the best image at around 3 to 4 feet. TVs once were restricted to small sizes, but today they can be up to 100 inches. The biggest difference is that projectors are priced more by the quality of the image and what features it offers, such as Bluetooth or DVD slots. TVs, however, are usually more expensive the bigger they are. Therefore, if size is the most important feature, a projector gives you the same size at a fraction of the cost. Projectors use light to produce the image on your wall. If the room is too bright, it can wash out the image, making it harder to see. It is, therefore, more important to ensure that the room is very dark. Blackout curtains or blinds, or setting up a windowless viewing room, can make it easier to see the image. It is possible to find projectors that produce a brighter image. The key is looking at the number of lumens it produces. For a dark room, 1000 lumens is good, 2000 for a room with some light, and 3000 for a room with a lot of light. Keep in mind that you will pay more for a projector with more lumens, and even at the brightest, they can still wash out more than a TV. TVs produce the same image regardless of ambient light. It can be daylight in the room, and you can still easily view the screen. TVs also offer better contrast. Projectors with brighter bulbs offer you more contrast, but this can vary depending on the amount of light in the room. When using a projector, the color of the screen or wall you are projecting onto plays a big part of the color accuracy of what you are viewing. A pure white screen gives you the best color accuracy. A wall or screen that is tan, beige, or off-white can throw off the other colors. Most projectors today offer very good resolution, provided that you set them up at the optimum distance from the wall. Each projector has a range that provides the best results if you stay within, but most offer around 1080p. They also offer the ability to show images in 3D. TVs offer the resolution that is input into them. For example, if you use cable, then your TV’s resolution will be 1080p. If you have a DVD or Blu-ray player that displays in high-def, then your TV will accommodate it as well. TVs also have the ability to adjust color, if necessary, to give you the best accuracy. Projectors and TVs may need no installation at all, or they may need professional mounting. In each case, the size and placement of the device, as well as how it is designed to be used, needs to be considered. Projectors are small. They can be lifted onto a table, plugged in, focused, used, and put away again. They can also be permanently mounted to a wall, a ceiling using brackets 1, or a shelf. However, projectors mounted to ceilings or walls may need to be reachable and removable to add gaming systems or other media. If the projector does not have a built-in 2 audio system, you will either need to mount speakers as well or invest in a Bluetooth speaker that can pick up the sound. TVs may be standalone units, placed inside entertainment centers, or they may be mounted directly to the wall. 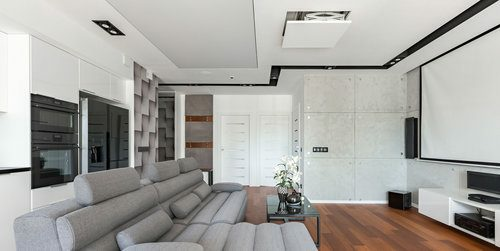 If wall mounting is desired, this should be professionally handled to conceal the wires and ensure that the TV is properly secured to prevent it from falling. Fixing a projector to a bracket 1 is fairly simple, and once the proper distance has been found, it screws directly into the wall or ceiling. This costs around $100 to $150 on average. TV mounting 3 is more involved. 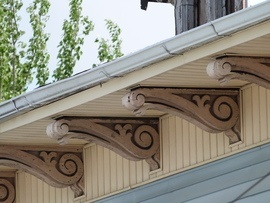 The bracket 1 needs to be secured to the studs and may require bracing if the set is large. To conceal the wires, you may need a new outlet installed as well. This installation costs closer to $1,250 for a 65-inch TV mount 3. Both projectors and TVs have a wide range of associated costs. Size, lumens, and definition all play a role in the final cost. For a projector with 3000 lumens, HD, and LED, which gives you a picture comparable to most TVs in the widest range of lights, the average cost is around $1,000, although models can range from $300 to $3,000. If you need to install the projector on a bracket 1, add an additional $150. If you need a white screen, add another $50. If the projector does not have built-in 2 audio, a Bluetooth speaker costs $150 on average. This totals $1,350 to project 65-inches and up. A flat-screen, LED TV measuring 65-inches has an average cost of around $1,500, with costs ranging from $800 to $4,000 for TVs with different sound quality and other features. With wall installation, the total is around $2,750. Projectors tend to be fairly small, ranging from 6 to 18-inches across. For this reason, they are portable. You can put them away when not in use. Some people find it best to set them up when you want them on a table to project onto the screen or wall to get the best resolution. 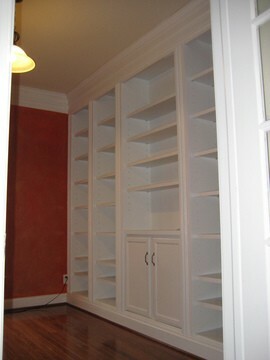 Other people may build shelves or racks to hold them on the wall or ceiling. If you use a screen, this can also be put away when not in use, or you can use a blank wall. TVs take up permanent space. 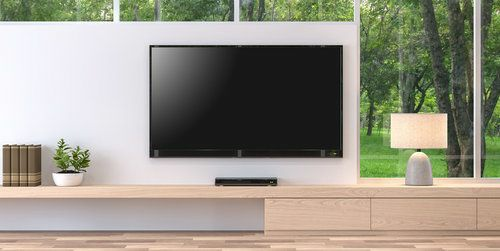 However, as TVs become thinner, they are more likely to be mounted on a wall, taking up little actual space within the room beyond their width. People spend a great deal of time looking at screens, which can lead to eye strain. Therefore, many people look to reduce that when choosing a home entertainment system. Both projectors and TVs can cause eye strain, but you can reduce it when you plan accordingly. In either case, you want the least contrast between the light in the room and what you are viewing. For that reason, choosing a projector with 3000 lumens that you can use in a room with more ambient light can help reduce eye strain when compared to a projector that needs a very dark room. Size also matters. Larger screens help reduce eye strain. Because projectors allow you to adjust the size, they may help in this regard, unless you choose an oversized TV screen. Both projectors and TVs have a lifespan. They vary depending on several factors, such as how well you take care of them and how much total use they get. Projectors that are not permanently mounted need to be moved and set up each time you want to turn them on. This can lead to damage over time, so a fixed location can help increase the lifespan. TVs mounted on the wall are less likely to be bumped or knocked, while TVs that are on furniture may take some abuse. Both devices need to be turned off when not in active use to preserve their images. However, when properly used and maintained, both devices can last for 10 or more years without issues. Both TVs and projectors require some degree of maintenance. Many TV manufacturers, particularly of larger models, are switching to LED to improve picture quality. However, this requires that the TV have good ventilation. You also need to turn it off after it has been on for a few hours to avoid having the picture begin to dim after a few years. Avoid turning the brightness and contrast up to their maximum, as this will also dim the screen over time. Projectors have a lamp, which can eventually burn out and need to be replaced. To avoid this, first turn off the image but keep the fan blowing on the projector until it cools down. Then, the projector can be turned off and put away. The length of time between turning off the lamp and being able to turn off the projector varies depending on fan speed and projector size. Projectors have fans to keep the lamp cool, which helps preserve it. Some models make a lot of noise when the fan is running, which means that you need to turn up the sound to hear your movie, show, or game. Some models have quiet or muffled fans, which can reduce this issue. TVs tend to have a quieter background, with no fan noise to compete with the sound. How much does it cost to install a projector or a TV in my city? Cost to install a projector or a TV varies greatly by region (and even by zip code). To get free estimates from local contractors, please indicate yours.